Great Mystery, on this National Day of Prayer for Mental Illness Recovery and Awareness, we pray for all who live with a mental health challenge and their loved ones. When the night is long and tomorrow seems uncertain, grant us peace. When mental health challenges overwhelm us, grant us peace. When a new diagnosis causes life to take an unexpected turn, grant us peace. When suicude seems like the only option, grant us hope. When treatment options are limited, grant us hope. When society confuses mental illness with violence, grant us hope. When we or loved ones begin the journey of recovery, we give thanks. When mental health professionals offer compassionate and excellent care, we give thanks. When faith communities are loving, non-judgemental, and supportive of people with mental illness and their families, we give thanks. Great Healer, may we recommit ourselves to creating communities of healing, justice, and peace. Amen. It’s been 365 days of blessings. 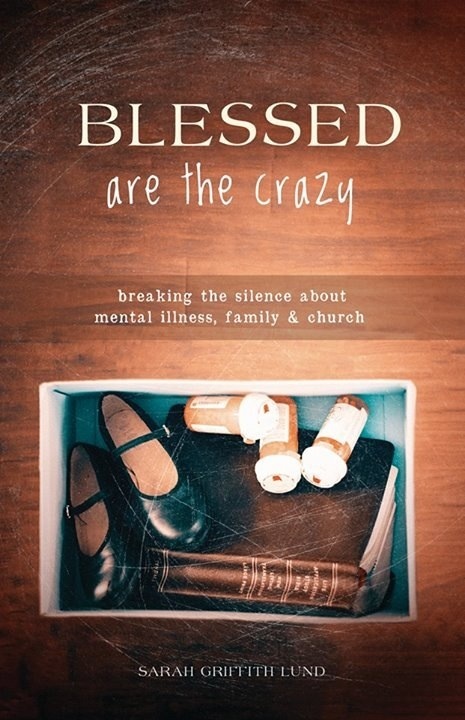 Three hundred and sixty-five days ago this week Blessed are the crazy: breaking the silence of mental illness, family and church was published by Chalice Press. Some highlights of the past year (in no particular order). Hosting a mental health conversation at a national conference for youth and hearing teenagers talking openly to their peers about the importance of friendship during depressive episodes, suicidal thinking and feelings of isolation. Speaking at a college campus about mental health and hearing the perspective of a Muslim student about the cultural context of stigma. Attending as a guest at a peer support group for people living with mental illness and spending time reading scripture and hearing how faith in a loving God offers hope. Leading a day of retreat with United Methodist clergy women and spending time constructing “crazy crosses” that honesty reflect our own experiences on the spectrum of mental health. Participating in bringing together a city-wide initiative in Jacksonville, Florida, that unites faith communities with professional mental health services. Breaking the silence about mental illness, family and church from pulpits and Sunday school classrooms and fellowship halls from Venice to Baton Rouge to Atlanta to Dover to Cincinnati to San Antonio to Hartford to Minneapolis to Indianapolis and others. Breaking the silence about mental illness at national gatherings such as General Synod of United Church of Christ, General Assembly of the Christian Church (Disciples of Christ) and Wild Goose Festival. Accepting the Dell Award for Mental Health education at the 30th General Synod of the United Church of Christ. Hearing the heartfelt stories of hundreds of people whose lives are impacted by brain disorders and diseases. Consulting with denominations on how to best train and equip congregations to minister to people with mental illness and their loved ones. Sharing my testimony in the context of mental health in the African American community and realizing how racism is a mental health issue. There is a shortage of mental health professionals of color and additional, unique barriers in communities of color to receiving mental health care. Filming videos, webinars, and hosting live WebX and Skype interviews with folks across the country (and across the pond in England) so that conversations about mental health can happen everywhere. Re-thinking theologically about what it means to see the church as the Body of Christ with disabilities. Being a fully integrated self and not living behind a mask of perfection. As a person whose life is shaped by mental illness, to be authentic and transparent is healing and liberating. Continuing to write, raise awareness, break the silence and work to end the stigma of mental illness because we’ve come a long way, but have an even longer way to go. Thank you all for the incredible support and encouragement. Accompanying my brother Scott along his journey, honoring his story and holding his life in my prayers. He inspires me to take the next step in the mental health movement. Having life-long family friends come up to me after reading the book and apologizing for not doing anything to help. They couldn’t have helped my family because we kept it a shameful secret. I learned how much additional pain and suffering was caused by the silence. Using proceeds from the sales of my book to support philanthropic interests such as mental health education and women’s leadership. Working with the publisher and talented staff at Chalice Press to get thee word out and break the silence. Feeling embraced and supported by incredible colleagues at Christian Theological Seminary, and the unconditional love from family and the prayers of friends. Experiencing the transformative power of giving my testimony and how it is not magic. It is something better. It is dirt and tears. Like childbirth, it is messy and raw, and it is what makes life worth living. Humbled by God’s blessings and so thankful to receive that which I do not deserve. I wonder what blessings the next 365 days will bring?